The Midnight Review: Andy Harris Believes Insurance Immediately Provided By Every Employer? Andy Harris Believes Insurance Immediately Provided By Every Employer? While everyone is reporting on the hypocrisy of wanting government health care while attacking it on the campaign trail, I saw something more interesting - his comment stating that the government is the only employer he had been hired by where he didn't get coverage on the first day of employment. I find that interesting because most employers don't offer insurance on the first day - many require employees to work a certain amount of days or hours before they are eligible, and in plenty of companies, only full-time employees are eligible. 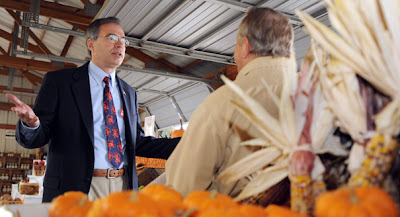 Does Andy Harris believe that if you have a job you have insurance? No wonder why he opposed health care reform! I had an insurance problem like Harris' a couple years back - I was laid off from by my employer, Albertsons LLC, and denied a severance plan because of a clerical error. I lost health coverage (which I was only eligible for because I spent a certain amount of time with the company) and I also could not afford COBRA - the severance plan was supposed to pay for the over $700 a month cost, but since I was unemployed, I had no way to pay for such a thing. I tried to rectify the situation with the company but Albertsons refused to disclose any documentation supporting their claims and denied any wrongdoing, insisting their clerical error was fact. Eventually I got hired by another company, and had to wait months to get coverage for my family again.